It's morning again in America. And I'm so bleeping proud of you guys! The midterms are over, but the biggest loser wasn't a candidate for a federal, state or local office. It was the credibility of a national "news" network. It was the moment Fox News stepped over the thin red line separating it from simply being a partisan booster to being what many accuse it of: state news. But unless the network addresses it in a way that publicly sets the record straight, we can assume it was just a slap on the wrist -- “nudge, nudge, wink, wink, say no more, say no more” -- and that Fox News is a willful participant in a state news industrial complex that has become this presidency’s White House. The fact that the episode was executive produced by former Fox News chief and current White House communications chief Bill Shine makes it harder to believe there isn’t an explicit connection. It’s time for Fox News to set the record straight. Are you or aren’t you state news? 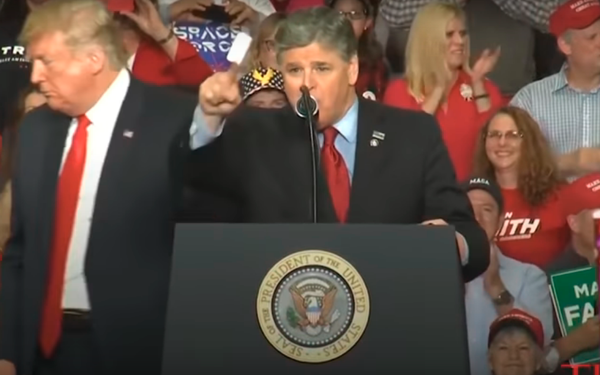 As for the people in the back Hannity called “fake news,” I’m so bleeping proud of you.